I understand that saving export presets is on the feature request list already -- +1. I'm trying to manually produce the same export results. Here're screenshots from both MacOS (latest) and iPad (latest), and the iOS exported image geometry differs from same export on MacOS. 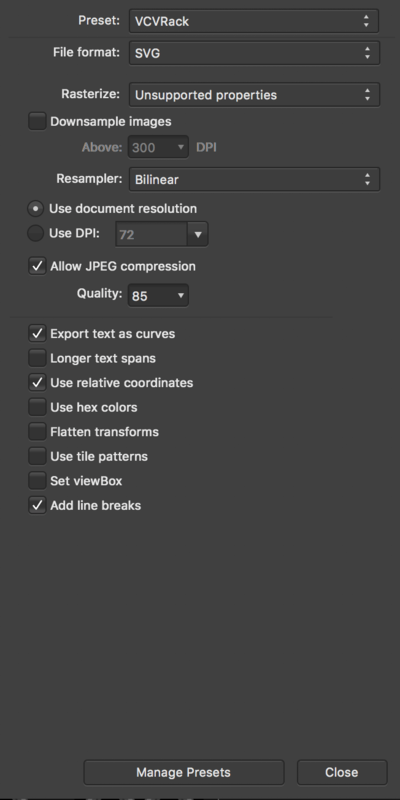 How can I replicate my export svg settings from MacOS to iOS so I can export from either with consistent results? Ideally it should be giving you the same geometry as the export settings are all the same! Would you be able to attach the afdesign file you're trying to export that is giving you differing results so we can try to reproduce. Looking at your files you have used Comic Sans for the text objects. The iPad doesn't have this font available, therefore it is being substituted with another font when you open the file. As you have got 'Export Text as Curves' the text is being converted to curves using the substituted font hence the completely different look. I did convert the text to curves on the macOS app first, save, export and then re-open on the iPad and export from there and the files provided were mostly the same. There was a couple of slight differences which could be down to a few improvements made whilst developing the iPad app. I used the iOS app AnyFont to install Comic Sans on my iPad and re-opened the source file. I then selected some text and confirmed that Comic Sans had been applied like it was on MacOS. Upon export from the iPad, geometry is still the same -- huge! By completely different look, I'm referring to the image geometry, not the font. For example, on the MacOS export, the geometry is width="90px" height="380px", while from iOS it's width="375px" height="1584px" -- both from the beginning of <svg/> tag. What'd I miss? Even with font substitution, the geometry/scaling shouldn't change, only the font substitution, right? What next? I'm still hoping for an iOS/MacOS compatible workflow where I load my native project files and export .svg from either with the same/interchangeable results. Let me know if there's anything else I can do from my end to assist. I've opened both of the files you sent me and the visual look of the graphics are the same. The reason for the large amount of geometry in the SVG is that you have 'Text as Curves' enabled on your export. That is converting all of your text into curve objects which will create a large amount of paths and nodes - hence the amount of nodes in the SVG. iPad Designer may have benefited from some SVG fixes that have been made, that are yet to make it onto the desktop release which could be why the scaling is slightly different. I'll pass that on to development. For example, on the MacOS export, the geometry is width="90px" height="380px", while from iOS it's width="375px" height="1584px" -- both from the beginning of <svg/> tag. Any updates on MacOS/iOS SVG export compatibility?